(Newser) – One day after embattled Zimbabwe President Robert Mugabe shocked his countrymen by refusing to step down, his own party is getting ready to impeach him. A senior member of Mugabe's ruling ZANU-PF party says the motion to impeach the president will be presented to parliament on Tuesday and that Mugabe could be removed from power as early as Wednesday, the BBC reports. The main charge? That Mugabe allowed his wife, Grace, to "usurp constitutional power" when he fired his vice president, Emmerson Mnangagwa, two weeks ago, a move seen by many as an attempt to position his wife to be the next president. The military seized Mugabe last week and has been holding him under house arrest ever since, though it insists the action isn't a coup. 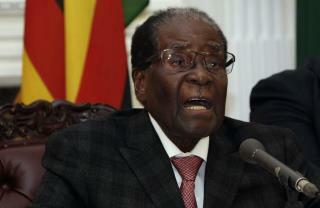 On Sunday, ZANU-PF leaders told Mugabe to resign or face impeachment. In virtually every pic I've seen of her. She looks outraged. Scary lady to be in charge of anything.